How do I manage or cancel my WaterAlert? What are the data parameters available for subscription? 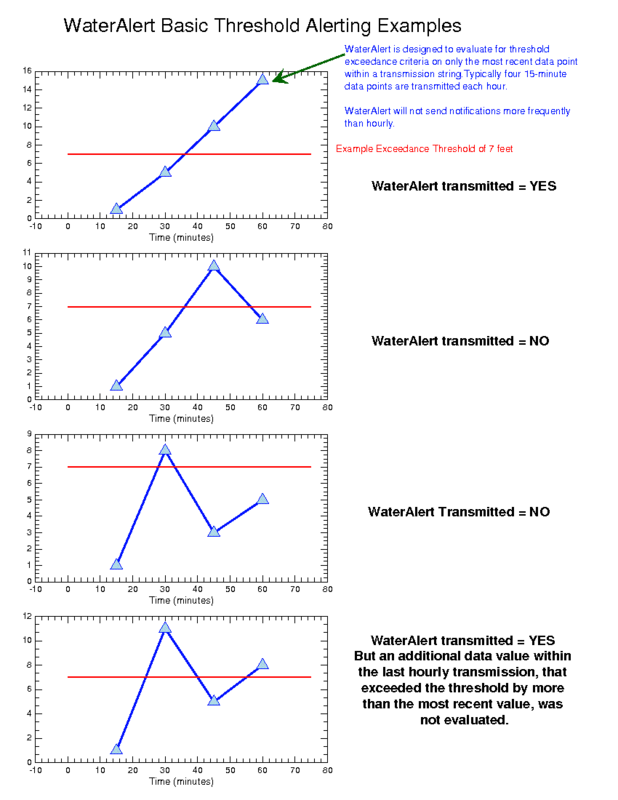 Why did I not receive a WaterAlert when my threshold was exceeded? Check your Spam mail folder. Emails are sent from the domain @usgs.gov - please set your email spam filter to accept emails from @usgs.gov to ensure proper delivery. In every case, in addition to using alerts as a notification tool, WaterAlert users are strongly encouraged to monitor ongoing conditions at sites of interest using waterdata.usgs.gov, particularly after they have recieved a notification that their threshold has been exceeded. Regular monitoring will show how conditions are changing over time and provide a better basis for making important decisions for protection of life or property or uses of water resources. Why isn't a known real-time site on the map? The site is seasonal, resulting in no real-time data at this time. Why does the Search feature fail to find a known site? Searching is dependant upon your current state/territory and data-type selection. Therefore, searching may fail if, for example, you are searching for a groundwater site but your currently selected data type is surface water. Why do you need my email address when I submit for text (SMS) messaging? Your email address is required for a one-time confirmation. Shortly after you submit this form, you will receive an email to which you must reply, without altering, in order to activate your SMS subscription. We do not share that address (see our Privacy Statement). Can the time that notifications are sent be set to a certain time of day? There is no way to explicitly set a time of day for notifications. For a 24-hour WaterAlert, the alerts will start 24 hours from the time that the notification was confirmed. If a selected threshold continues to be exceeded, notification will not happen for another 24 hours pending the next update from a gage. The notifications will tend to be at the same time of the day, but can drift over time. If the value drops below the set threshold so that no notification is sent for a while (perhaps days or weeks), and then, for example the threshold is exceeded at 2 AM, the 24 hour timer would then be reset from that time. It is very unclear what the "right thing to do" would be relative to setting a time of day for notifications. If a customer wanted a 3PM notification, but their threshold value was exceeded at 10AM ... would they want a notification? Or if the value briefly exceeded the threshold in the morning but was back to normal by 3PM, would they want a notification at 3PM? A possible implementation would be to allow users to set intervals of time to which to restrict notifications, say from Noon to 3pm, 3pm-6pm, 6pm-9pm, etc. Unfortunately there is currently no way to update the address, the old subscription would need to be deleted and a new one created. I've just recieved a "WaterAlert quarterly subscription summary", do I need to do anything to continue my subscription? On a quarterly basis, timed with the changing of the seasons, all WaterAlert subscribers receive a summary of their subscriptions. This is informational only. No action is required to continue the subscriptions. WaterAlert was developed to better inform water professionals, recreationalists, and the general public of the latest hydrologic conditions utilizing USGS real-time data and "active" data dissemination techniques with emails and text messaging. It can be used for floods, droughts, general water monitoring, and recreational purposes. WaterAlert development began in the Fall of 2009 with the creation of a committee to create a list of requirements necessary for a national product. It was based upon the North Carolina NC-HAS product which was a proof-of-concept of the idea. The WaterAlert service was publicly announced on May 17, 2010.